Our teachers come from all over the world: Germany, USA, Australia, England, South Africa, and others. 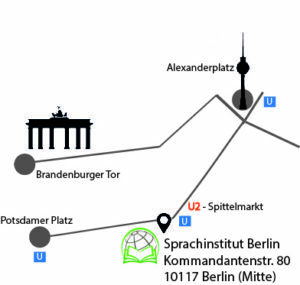 Meaning all lessons taught at SPRACHINSTITUT BERLIN are by experts using their mother tongue. Our teachers have plenty of experience in teaching their language. Therefore, they can provide a genuine understanding of what they are teaching, using various techniques and teaching methods. Do you have specific grammar questions? Would you like to understand why the language is structured the way it is? 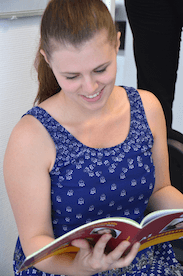 Our teachers are qualified experts and are able to answer all of your questions! Our teachers will motivate you through intensive class-involvement and an enjoyable atmosphere. Learn quickly and efficiently in small courses. Each of our courses contains a maximum of 8 students, leaving plenty of space for in-class interaction. Have the oppourtinity to speak in every class, and enjoy yourself during the learning process. Various teaching methods give you the opportunity to learn the language from all it’s aspects leaving no room for boredom. Moreover, our school is equipped with modern technology, making it simpler for our teachers to guide you towards your goals. Do you wish to quickly proceed with your level and learn the language from A to Z? Then we are the right language school for you! Our courses are divided into 12 language levels according to the Common European Framework of Reference for Languages (CEFR). This will allow you to learn with other participants in the same language level. A homogenous language level will ensure a quick learning progress for all participants. Each course covers half level. Familiarize yourself with everyday expressions and phrases. Learn to introduce yourself, ask questions and talk about simple topics, such as family and personal information, shopping, local geography or employment. 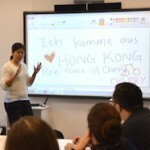 Exercise full conversations in the foreign language within our B-Levels. Be able to understand the main ideas of complex texts and express your viewpoints freely. Express ideas fluently and spontaneously without searching for expressions. Learn to be able to differentiate between finer shades of meaning and come close to speaking like a native-speaker. With our specially developed written and oral placement test all of our students are enrolled in the most suitable course level and will receive the most efficient training they can get. 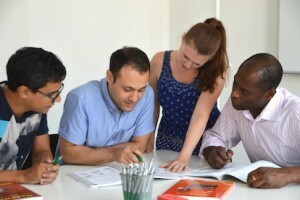 Ask our experienced personnel about your language level and the best way for you to improve your skills. 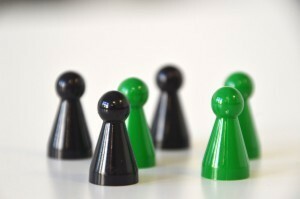 Our team speaks English, German, French, Spanish, Italian or Indonesian.